Download the very best games for Mac! Your Mac Games: all the best Mac games downloads! 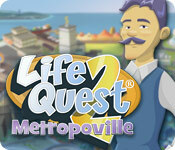 Move to Metropoville and begin a 12 step Life Quest program! Find a new rewarding career in this incredible Strategy game! Upgrade your vehicle, purchase a pet, and even find true love as you move up the social ladder. Go from rags to riches and complete challenging quests and difficult objectives to earn cash that you can invest in yourself! Race around Metropoville taking important classes, working awesome jobs, and enjoying your day in Life Quest 2: Metropoville! Fill out your e-mail address to receive our newsletter when new games are available! Your email will be kept confidential. Bring hope to the people of Egypt in The Timebuilders: Pyramid Rising, an exciting Time Management game! Journey across Italy as best-selling novelist Dana Knightstone in Death Under Tuscan Skies: A Dana Knightstone Novel! Tell your family and friends about YourMacGames.com ! (c) 2009, YourMacGames.com - All rights reserved. Trademarks mentioned are the property of their respective owners.